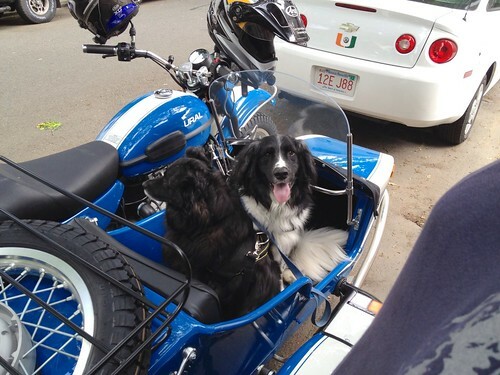 The whole reason we got a Ural was so we could bring the dogs with us on our motorcycle trips. No more missed camping trips or weekend events because our dog-sitter isn’t available. And no worries about returning home to broken or abused pups, like on our Americas trip. Now that we’ve got a functional Ural, it’s time to start acclimating the dogs! 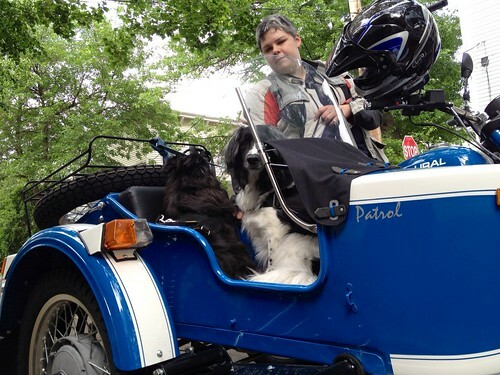 We put in the custom Pooch Pad that we got for the dogs (a fancy padded cushion that replaces the stock seat in the Ural, giving the dogs a flat cushion that runs the entire length of the sidecar) and brought the dogs out in their new harnesses. As you can see, Bandido was totally digging it. He was happy to jump in just as soon as he got the confidence to take the leap, and he was ready to GO. Ben wasn’t so sure. He didn’t want to get in, and when I forcibly put him in, he wanted to jump out as soon as I walked away. A quick drive around the block did help. Ben seemed more into it once we got moving. Bandido, on the other hand, was utterly in heaven. After I came back from the quick jaunt, I turned off the bike and stepped off and Ben IMMEDIATELY hopped out of the sidecar rig. 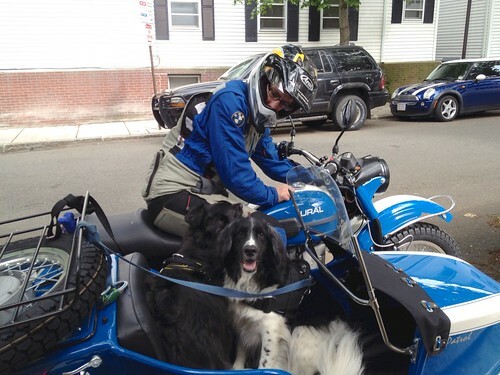 We discovered that his leash had enough play he could walk around the outside of the sidecar while still attached. Fortunately, he didn’t take that plunge while we were moving. After coaxing my reluctant dog back into the sidecar (he jumped back in on his own this time after I asked him to) I sent Kay out to do a second trip around the block. I figure it’s good to get the guys used to going with both of us, and Kay’s dog totally wanted to keep going anyway. Kay got up a little faster, and said that my dog did better on that jaunt. Deciding that was enough for the day, we took the dogs inside and resumed our futzing with the new bike. When I took them out for a walk later that evening, Bandido was uber excited and obsessed with finding the sidecar again. He walked up and down the sidewalk sniffing the air looking for it. Ben just wanted to get on with his business. We went out on the bike today to give it a good break-in ride (just the people, this time) and Bandido kept trying to run out to the rig when we were going in and out of the house. 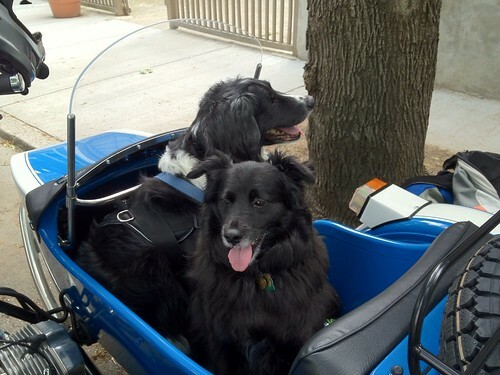 And when I took them out for their evening walk, after being out on the bike all day, both dogs were sniffing around trying to find the sidecar. So I think we’re on the right track! We bought some hardware from Home Depot and intend to mount some anchor points in the trunk where we can run some straps and attach the dog harnesses. I think it’ll be a better way of securing the dogs when they’re in the rig. We’ll work on that mounting system tomorrow, and then feel out the dogs about potentially taking them out for more fun. Maybe this time to a local shop that sells dog cupcakes, or to an awesome super fun walking/hiking place. I think the dogs would enjoy either and would have some great positive associations for the rig. Looking forward to seeing what happens next. I’m in a similar situation and I’d like to fin a way to take my year-old dog with me on rides. Big investment for something that she may ultimately not take to. Meanwhile, I’ll keep checking in.